As a kid growing up in the early baby boom years, I could understand World War II because it was familiar to me. The stories were all around me. A friend’s father down the street had a Japanese carbine.Guadalcanal Diary was an exciting read, as was Thirty Seconds Over Tokyo. Movies such as “The Sands of Iwo Jima” and “The Longest Day” (which seemed to star every major actor in Hollywood, including John Wayne, Richard Burton and Sean Connery) filled the movie screens. It was World War I, the one known as “The Great War,” that didn’t make much sense. It was long ago and complicated, a jumble of combatants that were difficult to sort out. It seemed to lack the drama of Midway or Normandy or the Flying Tigers. That ended with a single museum visit in an unlikely place – Kansas City, Missouri – where I began to make sense of it all. Kansas City is the home of the National World War I Museum, and the enormity and pathos of that horrible time hit me as soon as I entered. Once inside, I stood on a glass bridge that leads to the major exhibit areas. Beneath my feet and through the glass was a field of poppies, 9,000 of them. It was an attractive and appealing art installation until I read that each of the red poppies represented 100,000 lives. More precisely, each poppy represented 100,000 deaths. That beautiful field of poppies was a statement about the nine million combat deaths of World War I. Downtown Kansas City is a pleasant place with big office buildings, hotels, sports facilities, restaurants and the like, and the National World War I Museum is one of its landmarks. Finding the museum is easy. Although its galleries are hidden underground, the 217-foot-tall Liberty Memorial Tower rises conspicuously above them. Beside the tower are two giant stone sphinxes – “Memory” faces east, with its wings shielding its face from the horrors of the European battlefields, while “Future” faces west, with wings covering its face to symbolize the unseen time ahead. Inside are the poppies and a well-told story of complicated political alliances, colonial empires and entire societies on the verge of incredible unrest and change. The galleries trace how a single gunshot in Sarajevo in 1914 led to the first global conflict. Thirty-six nations took up arms, and 65 million men and women served in the military. I was pleased that the museum transcends the expected displays of military hardware – impressive though they are – and tells the war’s story though headlines, photographs, multi-media presentations and excerpts from soldiers’ journals and letters. 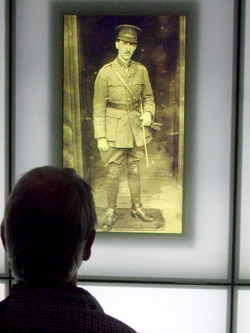 The museum made the war human and personal. The war raged for years before Americans went “over there,” and one of the museum’s most impressive presentations addresses that history-changing decision. It’s a 15-minute multi-media program about America on the threshold of involvement, and it’s a complex story that includes the sinking of the British ship Lusitania (1195 deaths, including 128 Americans), Germany’s 1917 resumption of unrestricted submarine attacks on any ships headed to Great Britain and feelings of a moral imperative. As I tried to absorb the presentation, my eyes keep looking down at a recreation of a battlefield trench complex that seemed the length of a city block. The program on the screen and the jagged, muddy, bloody, frightening battlefield tableau below powerfully reinforced each other. The museum’s whole story was big and powerful, clear and understandable. It was a history lesson I was glad I finally had gotten. I was in Kansas City for a convention, and I began to wonder why that mostly European war was commemorated in the American heartland. The reason is that the earth-shaking enormity of the Great War had a profound emotional impact on people all over the country. Just two weeks after the November 11, 1918, armistice, Kansas Citians began a campaign that eventually led to construction of the Liberty Memorial. A community-based fundraising drive garnered $2.5 million in 1919, and the tower opened in 1926. Public and private money addressed restoration needs in the late 1990s, and in 2004, a bond issue funded today’s modern museum. The same year, it was designated the National World War I Museum. 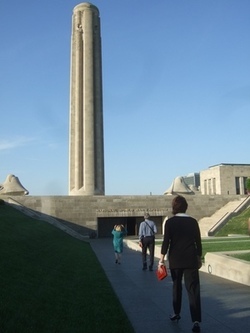 * For details about the National World War I Museum at Liberty Memorial, visit www.TheWorldWar.org, and for information about all Kansas City has to offer, go to www.VisitKC.com.